Following the extremely successful Steve Jarand 2009, 2010, 2011, 2012, 2013, 2014, 2015 & 2017 workshops. I have organised for Steve to come back to London in April 2018 for his ninth UK workshop. In 1987 Steve stumbled onto improvisation at the Loose Moose Theatre in Canada. Spontaneity and accepting made sense to him and he was excited to break rules and to "make it up as went along". He went on to spend four years under the auspis of Keith Johnstone who taught him acting and improvisation at the University of Calgary. After graduating, he needed to explore so he left for Europe. Since then, his adventuring has brought him to South America, Africa and several trips to India. Between travels he worked in Provincial Parks in the Rocky Mountains doing Nature theatre. There he was able to put in practice his interest in skills like storytelling, puppetry and mask work. Steve would continually return to the Loose Moose to address his own fears and expression through improvisation. For almost twenty years he has continued working. Mainly through mask work, his improvisation continues to flourish. In 1998, he had his first experience with masks (a bad one) doing a stylized Comedia d'elle Arte play. Steve sensed masks could be much more, having seen Comedia style misbehaviour work wonderfully at the Moose. So he began making his own masks and bringing them to the stage. Keith noticed and supported masks at the theatre. Since then, Steve has been dedicated to workshops in masks and to performing in all mask shows. 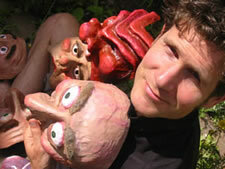 Today Steve is teaching drama and mask, working with children and doing science and nature theatre. Steve, Keith Johnstone and Dennis Cahill are leading the most recent and powerful series of mask workshops at Loose Moose Theatre. 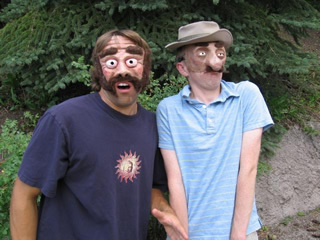 Most recently Steve can be seen co-leading a mask workshop on the KEITH JOHNSTONE TEACHES, volume one; Trance masks DVD. From tribal dances in Africa and performances in India to Steve’s own creations in Canada, masks continue to teach Steve a great deal about, spontaneity, accepting and exploring his own self. What can you expect from Steve's Workshop? With so much pressure on us to look right, think right, live right... it can be liberating to wear a mask! People continually manage themselves to seem smart, respectable, cool, funny, etc; whatever is consistent with our personal character. As yourself, it can be shocking if this model breaks down. But if it is not you; if the mask is being expressive and new, then calculated behaviour can be set aside and creativity can begin. Am I a suitable candidate for Steve's Course? In all Steve’s classes, he likes to have a variety of levels of participants; he enjoys the diversity and believes it is good for the entire class. It does not matter if you’ve never even done any improvisation or mask work; Steve’s courses are not only for performers. THIS LEADS TO THE GREATEST OF LEARNING ENVIROMENTS – TRUST ME! Steve’s work enables people to be more active, spontaneous and flexible. The exercises he will cover work to free the mind. your details and a little bit about yourself and why you want to work with Steve. As Steve sets no boundaries on who gets to work with him the course places will basically be given on a 1st come 1st serve basis. The non-refundable deposit will be required on receipt of confirmation of acceptance to the course. The remainder of the cost must be paid by the 23rd of March 2018.